Voice overs can go two ways: They can add a personal touch and help with the narrative, or they can drag a movie down into the duldrums. If you feel like your movie can benefit from a guiding hand voice, you can add them easily in iMovie. Pick which clip (or clips) you would like to add a voice over to. 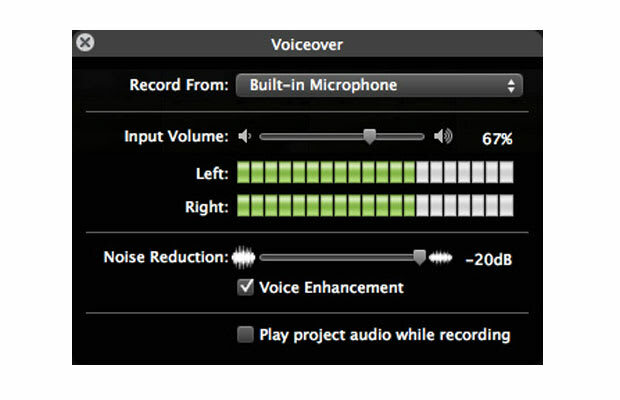 On the center bar in iMovie you will see a microphone icon—this is the Voice Over button. Click it. A window will pop up asking you which microphone input you would like to use and allow you to adjust the Noise Reduction. DO NOT CLOSE THIS WINDOW. Go back to the clip(s) you would like to add the voice over to and, when you are ready to begin recording, click the clips and record. Press the Return key on your keyboard to stop.